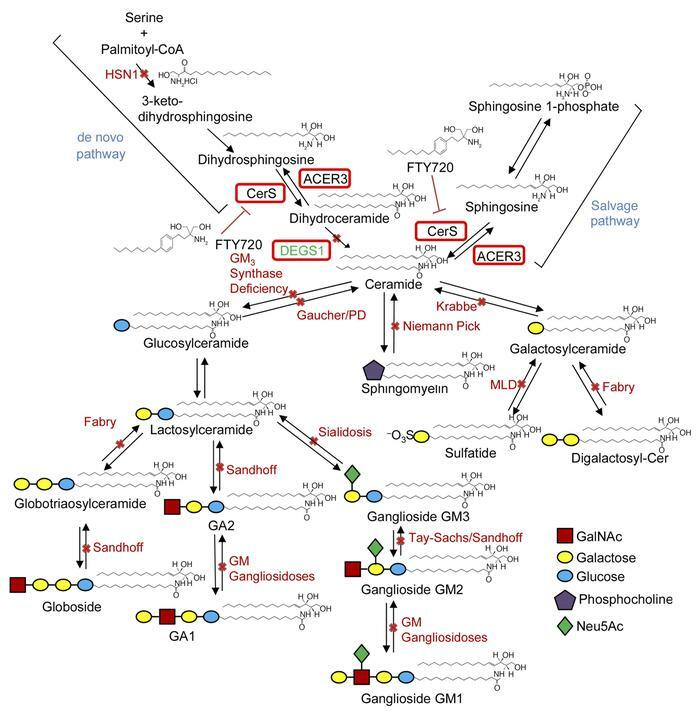 Scheme depicting enzyme defects associated with neurological disorders in the sphingolipid metabolism pathway, and fingolimod (FTY720) action. Serine palmitoyltransferase (SPT) catalyzes the initial reaction of the de novo sphingolipid pathway. Dihydrosphingosine is produced after an intermediate step regulated by 3-keto-dihydrosphingosine reductase (KDS), which is then followed by acylation by ceramide synthase (CerS) to produce dihydroceramide. The final reaction is the addition of a double bond by dihydroceramide desaturase (DEGS1) to form ceramide. Ceramide is metabolized by ceramidase (CDse) to generate sphingosine, which in turn produces sphingosine 1-phosphate through phosphorylation by sphingosine kinase-1 and sphingosine kinase-2 (SphK1/2). Sphingosine 1-phosphate can be catabolized into hexadecenal and ethanolamine phosphate by sphingosine 1-phosphate lyase (S1PL). Ceramide can be generated by the breakdown of sphingomyelin (SM) by acid (ASM) or neutral sphingomyelinase (NSM). FTY720 has inhibitory effects on CerS. Enzyme (in bold) defects are indicated by solid bars across the blue arrows. The names of diseases are shown in red text. ACER3, alkaline ceramidase 3; GalCer, galactosylceramide; HSN1, hereditary sensory neuropathy type I; MLD, metachromatic leukodystrophy; PD, Parkinson disease; Sap, saposin.